Have you recently tweaked your audio, perhaps added a compressor, and now your audio quality is poor because your microphone is picking up strange background static, echoes, or other noises? Here’s a quick and straightforward guide to removing background noise when you speak into your mic. 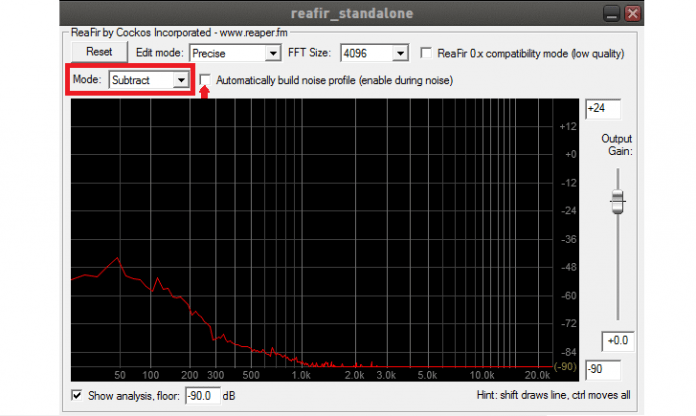 Follow Rhinehold’s guide for setting up Voicemeeter Banana. Follow my guide for setting up a virtual compressor with Minihost Modular (optional). Connect the left yellow node to the left yellow dot of the program, and the right dot to the right yellow node. 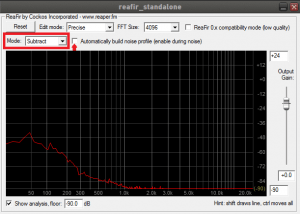 If you have set up the reacomp-standalone compressor, you’ll want to connect reafir after the compressor as pictured below. This is important because the connections determine the order in which your sound input undergoes the effects. A new window will appear on your screen now for reafir_standalone. Set the ‘Mode’ to Subtract. You’re then going to select the checkbox to ‘Automatically build noise profile’. Turn this on for about 10 seconds, do not talk or make any sound while this is active. You should see some movement in the graph as your mic picks up your background noise and sets it as a baseline. The subtract mode uses this profile and removes it from your sound, taking out the background noise. If you aren’t satisfied, feel free to keep turning on the tool to try to build the proper profile. If you change your audio settings in any way (i.e add a compressor), you’ll want to build a new profile. That’s it! This handy and simple tool will clean up the background noise when you speak into your microphone.